Hemingway dreamed of a contest for the best writer fisted on. So why not a cartoonist fight on a ring? Presented by the Sulger-Buel Gallery of London at the seventh edition of DDESSIN , Mohamed Saïd Chair exhibits a series of gray shades. 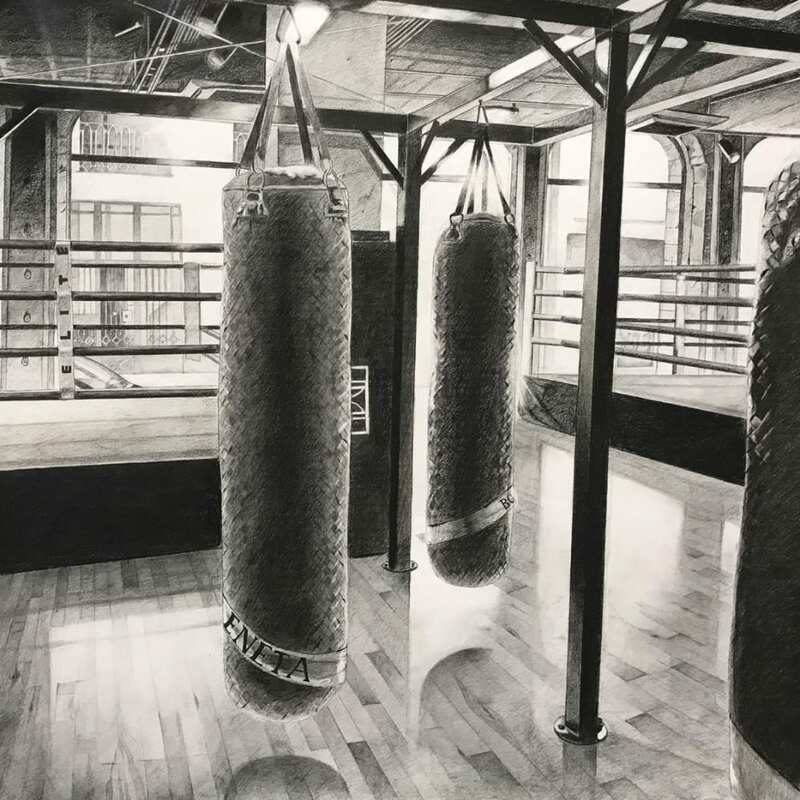 Produced in the graphite mine, these figurative and satirical works are devoted to the ecosystem of boxers, this athletic universe of contemporary gentlemen clubs where they live. A gym, empty. The design is structured by the horizontal and vertical lines of the poles, ropes of the ring, punching bags, heavy in the evacuated space. Everything seems hygienic and honest. Open on the outside, the platform gives no possibility to dissimulation and the circle. Yet, in many ways, this calm Olympian does not deceive: a beast slumbers inevitably. Proof of this is the strong underlying narrativity. The stability of the bag contains in power all the possibilities of its setting in motion: straight-punch, uppercut, overhand-punch or hook-punch. The fight will begin, or just concluded. Miss the only protagonists. In these environments, the gray shades of Mohamed Saïd Cher reflect the play of lights on things. Everything shines to welcome the scuffle. And what a presence! Listen, you'll see the thin lace-up shoes on the glossy floor. Ultra-modern, the canvas also comes to us from an antiquity dream. This asceticism, this channeling of violence, this apparent calm of the work of Mohamed Saïd Chair evokes ancient athletics. Philosophers point out that this manly and hegemonic ethos of struggle refers not only to an ideal of physical power but also to moral firmness. It is in the gym that the philosophical exercises were practiced. Mens sana in corpore sano. In the high-end gym temple feels the protocol inherited from the Greco-Roman struggle. Attitude, guard, defense, cover, parry blocked, riposte, dodge: the boxer's dance is regulated like a ballet. 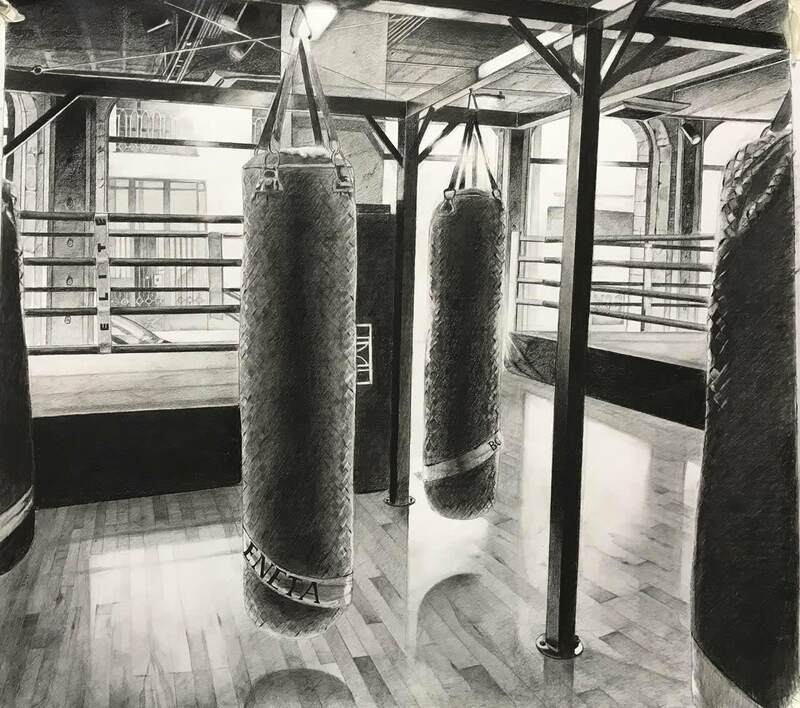 To complete the decor, the artist takes the attributes of the fighter as subjects of several drawings: the gloves, the shaker, the dumbbell bench. Which, located in front of a flat-screen TV, is covered with a towel lined with antique friezes. The dream of the potential demi-god is nourished as much by the screen as by the protein drink contained in the Elite shaker . In another drawing, the gloves stamped "Chanel" participate in the same comic parade. It is that the subtle irony of the draftsman offers a judicious counterpoint to the solemnity of the staging. Like any show, boxing has its headliners with the sometimes ridiculous pseudonyms of its champions; here, even the bags have their diminutive. "Human comedy" above all, boxing is a staging of figures, repetitions, codes, and aimed at satisfying the crowd and his need for a big show. It is not surprising that Roland Barthes begins his Mythologies with a wrestling analysis. In fact, sport tells us less about sport in itself than about the world in which it is practiced. Bet, surpassing oneself, victory-medal: these depopulated drawings question an attitude towards the image, his own in the first place. The hero of modern Olympus is paradoxically glorified for his ability to simulate: he gives the impression of meeting the requirements of the event and the image. From Rocky to Million Dollar Baby , boxing is all about cinema ... and therefore art.